Riese & Müller's comfortable Culture blends performance, comfort, control and utility. It’s a commuter that’s ready for just about anything. Designed around 27.5" (650B) wheels with a new, internal Bosch PowerTube battery. Two options for drivetrain include a derailleur drivetrain or internal Enviolo hub gear. The Riese & Muller Culture is a step-through that defies expectation - featuring disc brakes, full suspension, a wide array of drive options, and more. It's an adventure bike for someone who seeks comfort. Or is it a comfort bike for the adventurous spirit? We'll let you decide. You might have noticed that the Culture looks a lot like the Homage. What are the key differences between these two bikes? Namely, the Homage offers you more options. The Culture comes in one color, three sizes and two drivetrain options - the only motor available on the Culture is the high-torque Bosch CX Drive. By comparison, the Homage comes in one color, three sizes, two motor options and three drivetrain options. To put it simply, the Culture is recommended for urban riding and very light off-road riding. The full suspension will accommodate bumps and gravel, but the tires are not suitable for true off-road. If going offload is your bag, consider the Homage GX. When you test ride the Culture, you're struck with the amazing handling - this thing is both glued to the ground and incredibly responsive. 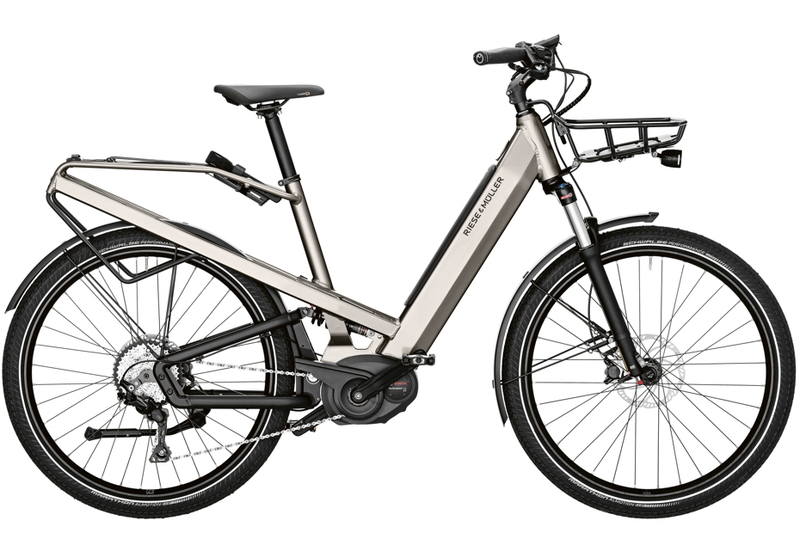 We find that as ebikes move faster, your control and comfort are key. Range on the Culture is around 50 miles per charge with the stock 500 Wh integrated battery. The Culture doesn’t offer the option for a second battery. So if you're looking for the longer range afforded by dual batteries, check out the Homage. A Truly Unique Full Suspension Step-Through. Many step throughs sacrifice performance for comfort - not so with the Homage. Full suspension, uniquely deployed, gives you the ultimate in comfort and control. Bosch Battery Now Integrated. Homage now comes standard with a Bosch PowerTube Battery hidden within the downtube. Shimano Deore 10-Speed Derailleur Drivetrain. An external drivetrain is crisp, light weight and efficient. Bosch motors detect your shifting and relax the motor torque to allow your shifts to happen swiftly. Enviolo Continuously Variable Drivetrain - Isn't that a mouthful! Essentially, Enviolo (formerly Nuvinci) makes time-tested hubs that, instead of having stepped gear levels to choose from, has a wide gear range with no steps. Simply move the shifter and feel the difficulty level change with no abrupt 'shifts.' Pairs extremely well with all Bosch motor options. Bosch CX Drive Delivers the Maximum Torque. Shy of getting super technical, just know that if you have steep hills to climb, the Bosch CX Drive will make you feel super human. No speed motor option on the Culture. Full Suspension Means Mega Comfort and Control. Many think that suspension is only for going off road. But, just like automobiles, suspension is useful on the road for maintaining comfort and control. Rear Rack is Snap-It Compatible. Racktime's Snap-It technology allows for numerous rear pannier options that can easily snap to the rear cargo rack.